Some men mark their midlife crisis by buying a Ferrari, but petrol-head Jeremy Clarkson has probably had enough of fast cars by now. Instead, he’s taking a ‘gap yah’ in South-East Asia, where he’s been doing arts and crafts and even picking up rubbish, as seen here with his girlfriend Lisa Hogan. 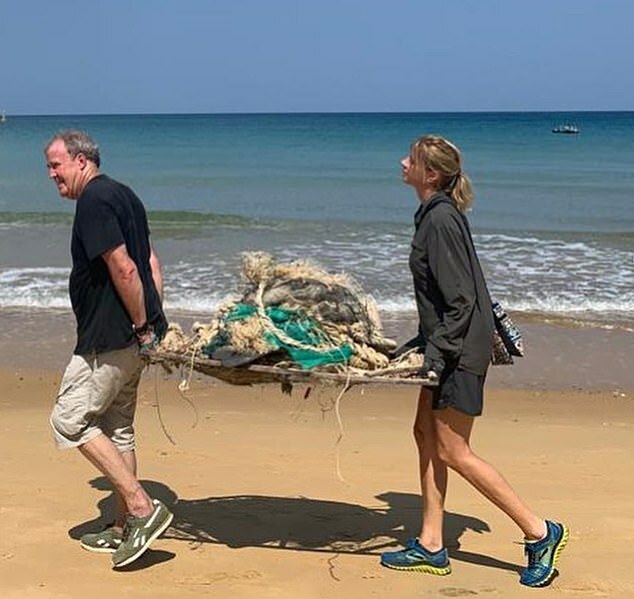 ‘In other news from Vietnam, we’ve been clearing litter from the beaches,’ Clarkson posted. The 58-year-old has been travelling with Lisa, 47, through Singapore, Laos, Cambodia and Vietnam – and has become an eco-warrior. ‘Last week, in Laos, I watched maybe 200 Chinese tourists throw all the plastic packaging from their picnic lunches in a river,’ he fretted on Twitter. Victoria writer Daisy Goodwin doesn’t watch rival show The Crown – in case she gets tempted to pilfer any of its ideas. ‘I haven’t watched it, but I don’t ever want to be accused of using someone else’s work,’ Daisy, 57, told me. There’s a lot of overlap – they’re both queens, they both have husbands frustrated by their positions.